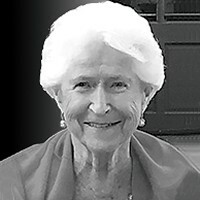 White, Margaret Joan (nee Vigard) Age 86, passed away on June 9th. She was the beloved wife of William Francis. Loving mother of William (Mary) White, Kathleen (John) Wessling, Thomas (Margie) White, Kevin White (Raul Barreneche) and Mary Hummell (Steve Evans). Grandma (Nonny) to Maggie White (Lamont Mimms), Billy (Kristen) White, Bridget (Tony) Carlson, Courtney and Brooke Wessling, Colleen (Henry) Slingerland, Patrick White (Caitlyn Matlak) and Kelly, Tommy and Katie Hummell. Great grandmother of Sophia, Max, Will and Theresa (deceased). Devoted daughter of Margaret ("Benny") and Elmer Anderson Vigard. Sister of Ronald (Sandra) Vigard and Diane Klein (deceased). Dear friend and neighbor of sister-in-law Rosemary White. Aunt of Debbie (Jim) Donnelly, Dina (Rich) Simon, Susie (Tim) Edmundson and Kristen Vigard (Brian Secovnie). Visitation will be held on Wednesday, June 13th, 5-8 PM at Leonard Memorial Funeral Home (630-469-0032), 565 Duane Street, Glen Ellyn. Funeral Mass, Thursday, June 14th at 10 AM at St. Petronille Catholic Church, 420 Glenwood Avenue, Glen Ellyn. In lieu of flowers donations are appreciated to William F. White Family Scholarship Trust, care of St. Petronille Church. Margaret ("Joan," pronounced uniquely as Jo-Ann) was born in 1932 in Milwaukee, Wisconsin, and was raised in Minneapolis, Minnesota. She attended the University of Minnesota where she was a member of the Alpha Phi sorority. She met the love of her life in 1950, the dashing young Bill White while visiting her Aunt Annetta and Uncle Harold in Glen Ellyn, Illinois. It was love at first sight for both of them. Their first date was reportedly to Sunday mass at St. Petronille Catholic Church. Bill proposed to Joan at the Grotto at the University of Notre Dame. They were married on October 18, 1952 at the Basilica of St. Mary in Minneapolis. They made their first home together in Indianapolis, Indiana while Bill served in the U.S. Army at Fort Benjamin Harrison. They had their first child, Bill Jr. in Indianapolis. They subsequently moved to Glen Ellyn, Illinois, where they had four more children: Kathy, Tom, Kevin and Mary. Bill and Joan enjoyed decades of happiness among dear friends and extended family in the Glen Ellyn-Wheaton area. Bill and Joan loved golfing and spending leisure time with friends and family at Chicago Golf Club in Wheaton, Illinois. Joan was involved with various charitable organizations, including St. Petronille, Marianjoy Rehabilitation Center and the Rehabilitation Institute of Chicago. Joan lost her beloved husband on Christmas night, 1999. Ever since then, she was the proud matriarch of the ever-growing White family. She never removed her wedding ring, and never considered remarriage, saying, "my closets are already full!" Joan was widely admired for her strength, energy, elegance, humor and grace, as well as her always-fresh pink lipstick. She was a true classic who will be deeply missed and always remembered.